Walking down the dairy aisle at a grocery store can be overwhelming, with yogurt available in what seems to be every flavour, package colour and size imaginable. This once simple calcium-rich milk product is now leaving people confused with an abundance of options. Depending on your age, health requirements and taste buds, not every yogurt will be right for you. Those looking to lose weight may opt for non-fat yogurts, while people who aren't picky may want to try out every flavour of the rainbow, says Rosanna Lee, a nutrition educator and community health promoter based in Toronto. Our bodies need healthy amounts of "good bacteria" in our digestive systems to function, and most yogurt is a great source. Probiotics, a micro-organism found in live culture yogurt, is beneficial for treating health conditions like yeast infections, diarrhea or irritable bowel syndrome, according to a report by Harvard University. On a less illness-based note, yogurt is also a great source of protein, calcium, potassium and B vitamins. Recently, other types of yogurt have become the centre of attention, like Greek yogurt, which is slightly thicker and has no whey, lactose or sugar, and kefir, which is thinner and contains three times the amount of probiotic cultures compared to regular yogurt. While it's great to have options, all of this has lead to even more confusion about which yogurt to buy. What about flavoured choices, low-fat dairy or yogurt for kids? To decipher all these labels, percentages and types, Lee has come up with 10 things to consider when buying yogurt. In order to figure out which yogurt you want, read the front first. Yogurt generally comes in three types: regular (3.25% milk fat [M.F. ]), low-fat (0.5-2.0% M.F.) and non-fat (less than 0.5% M.F. ), and this can be the first (and sometimes only) step in choosing your container. For children under the age of two, it's generally advised to buy regular yogurt made from whole milk with at least 3.25 per cent milk fat, says Rosanna Lee, a nutrition educator and community health promoter based in Toronto. 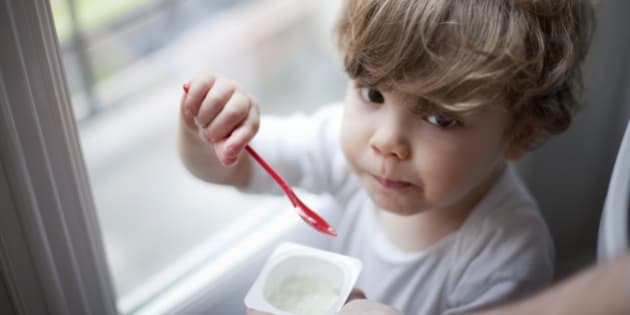 "Since children’s’ bodies are continuously growing, we should not deprive them of the various nutrients in yogurt that include, but are not exclusive to, vitamin C, A, B and D."
With adults, your options aren't as limited. While regular or full-fat yogurt is fine for most people, those who are looking to manage their weight or have chronic diseases should consider low-fat and non-fat yogurts. But Isn't Fat Supposed To Be Scary? Depending on who you ask, fat can be a scary word when it comes to food. When it comes to yogurt, Health Canada recommends buying yogurts with five per cent or less fat. Also, if you realize your yogurt contains 15 per cent or more of your daily fat intake, you may want to change up that brand. Lee says elderly individuals can benefit the most from eating yogurt regularly — especially if they are otherwise unable to meet their daily nutrition recommendations. "Being nutrient-dense, a single serving of yogurt can provide many essential vitamins, minerals and proteins that support the body’s needs, particularly for maintenance and for daily functioning," she says. Generally, sugar is seen as the enemy when we talk about healthy eating, and while Lee says there are no stated sugar recommendations for weight maintenance, most of us know better. If you're looking to cut down on sugar, try comparing sugar content among several brands. Commonly, 100 grams of non-fat Greek yogurt has about three grams of sugar, which is a "good" number to look for, say Lee. Flavoured and colourful yogurts generally look appetizing, especially compared to the boring old white stuff. Lee says there are no disadvantages in choosing flavoured yogurt over non-flavoured ones — they both provide the same overall nutrition and health benefits. Non-flavoured yogurts may be better for someone watching their weight but if you're not picky, give flavoured options a try! Just one last thing: flavouring doesn't count as a fruit serving. But Isn't Plain Homemade Yogurt The Best? For the most part, plain yogurt made at home contains no preservatives, stabilizers, artificial colours, fillers or sweeteners, so it's often seen as more natural or wholesome. But Lee says it also has a short shelf-life and is not always easy to make on your own. And It's Good For My Teeth, Right? Based on studies, calcium and phosphates in yogurt help to fortify your teeth’s enamel, keeping them protected and healthy, Lee says. Yogurt has also been found to fight against tooth decay, plaque build-up, and protect your gums from disease, while keeping your breath fresh (just add some fresh mint). One of the worst things you can do is buy yogurt lacking calcium. Lee says yogurts with less than 20 per cent of your daily calcium intake are a no-no — or rather, a 'why bother'?